city food. country kitchen. | Bringing the restaurant home in the land of common food. Bringing the restaurant home in the land of common food. This Ice Cream is Bananas! I absolutely love the flavor of a perfectly ripe banana atop an ice cream sundae or in a milkshake, but I had never tried making banana ice cream. I thought a cornstarch based ice cream would be perfect to let the banana flavor really shine through, but I couldn’t find the right recipe. I often start with Mark Bittman’s cornstarch ice cream recipe as a base, so that’s where I began with this, but tweaked it to incorporate the wonderful flavor of ripe bananas. This tastes great as is, but I also enjoyed it with a heavy dose of cinnamon and several tablespoons of bourbon in a recent batch. First, add bananas, vanilla, cream cheese, and maple syrup to food processor and puree until smooth. Then, put 2 cups of the half & half into a saucepan over medium heat. Add sugars and salt, then stir. In the meantime, combine the remaining 1/2 cup of half & half with cornstarch and stir until smooth. Once the half & half and sugar mixture is hot, pour in cornstarch mixture and whisk constantly for 3-4 minutes until the mixture is smooth and thick. Turn off heat and whisk in pureed banana mixture. 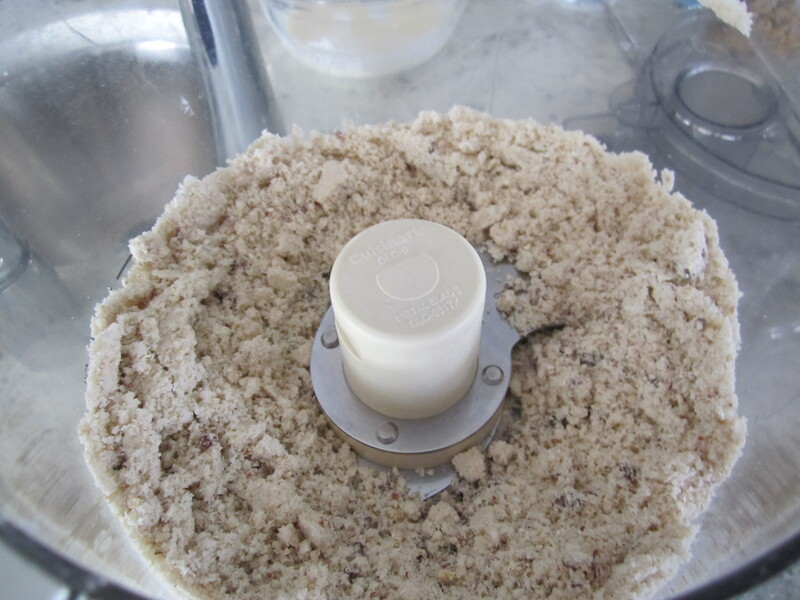 Once combined, force the mixture through a sieve and refrigerate until cold before processing in your ice cream maker. To speed up the cooling process, you can add the ice cream base to a gallon size bag and either put it in an ice bath or freeze it for about an hour. If you do put the bag into the freezer, just be sure not to forget about it! I was impressed with how this turned out and am happy to share it with you. This will be a go-to at our house. While still indulgent, the bananas and absence of eggs make this slightly lighter than most homemade ice cream recipes. 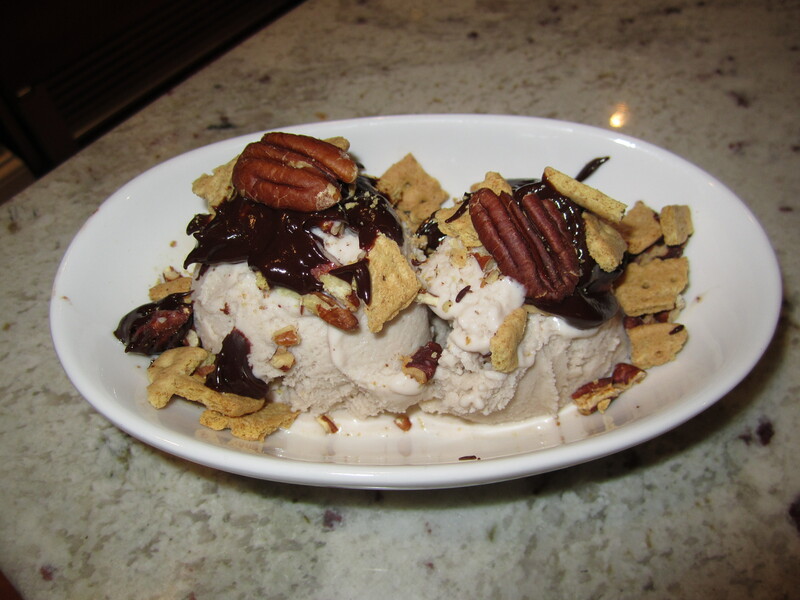 As you can see, I served this with some graham crackers, pecans, and dark chocolate in the featured photo. This combination was great, but I am thinking some fresh sliced strawberries will be my next topping for this tasty frozen treat! Posted in Desserts/Treats, Uncategorized and tagged bananas, ice cream. Bookmark the permalink. I really like scones, but whenever I look up recipes to make them I find myself turned off by the high butter content combined with the regular use of heavy cream. 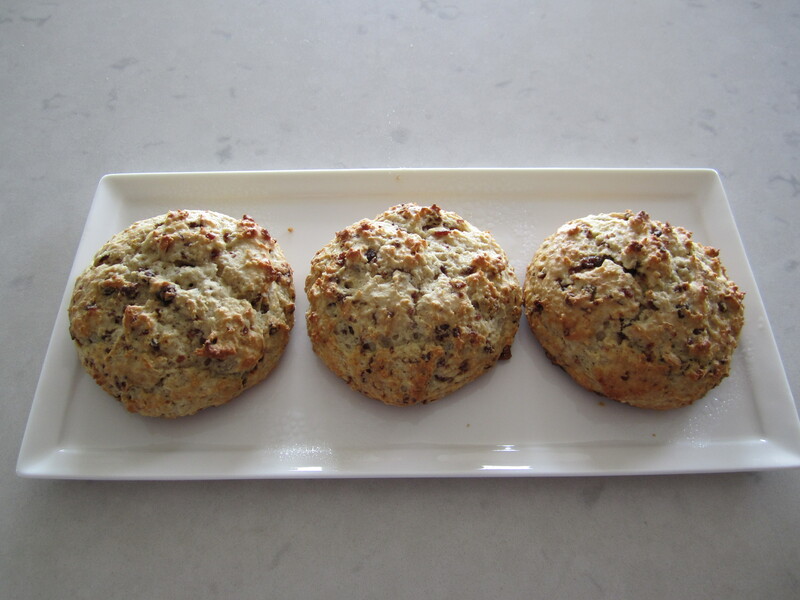 This was my attempt to make a scone that is just a tad lighter without sacrificing taste or texture…but please note they are still not a low-fat food. I also like this recipe because I pretty much always have the items on hand to make a batch. 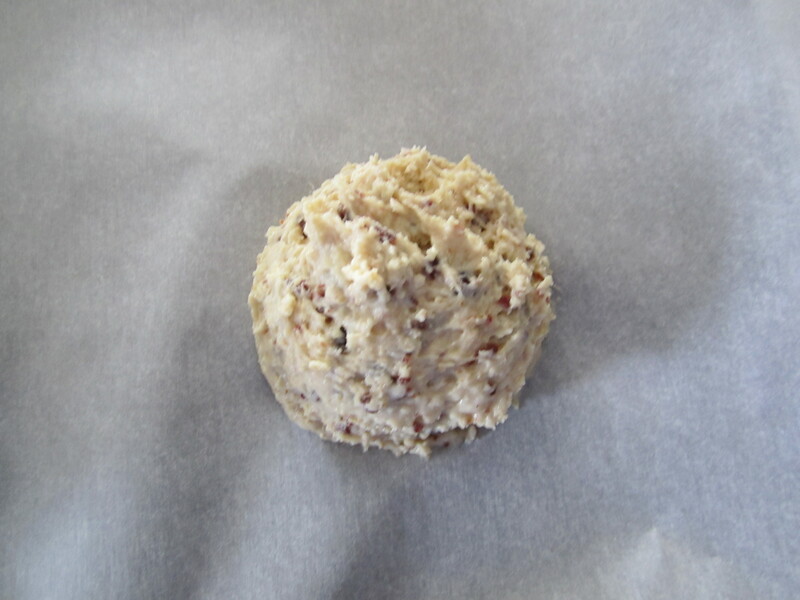 In a food processor, pulse together the flour, oatmeal, sugars, salt, dried cherries, and butter until mixture resembles crumbs as pictured. In another bowl, beat egg. Then add sour cream, milk, and extracts until well blended. 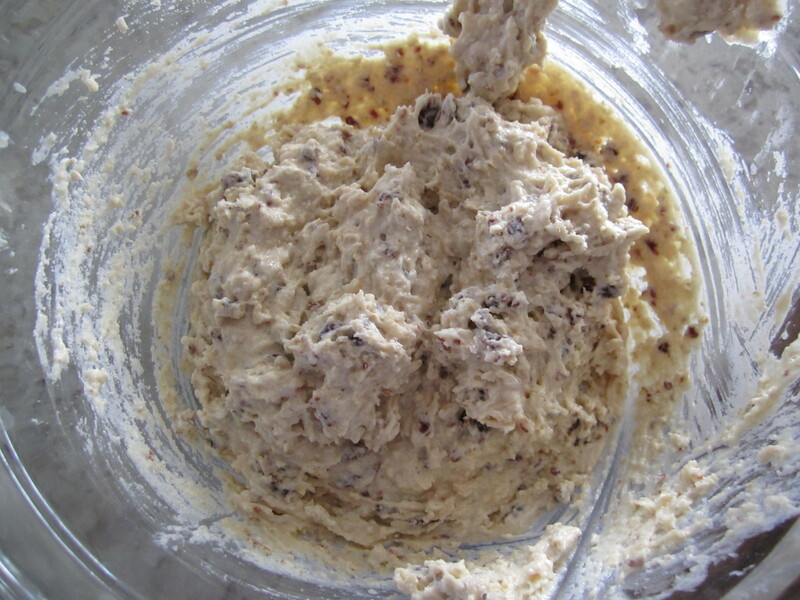 Using a fork, slowly add dry mixture into wet mixture until just combined. Do not over mix. 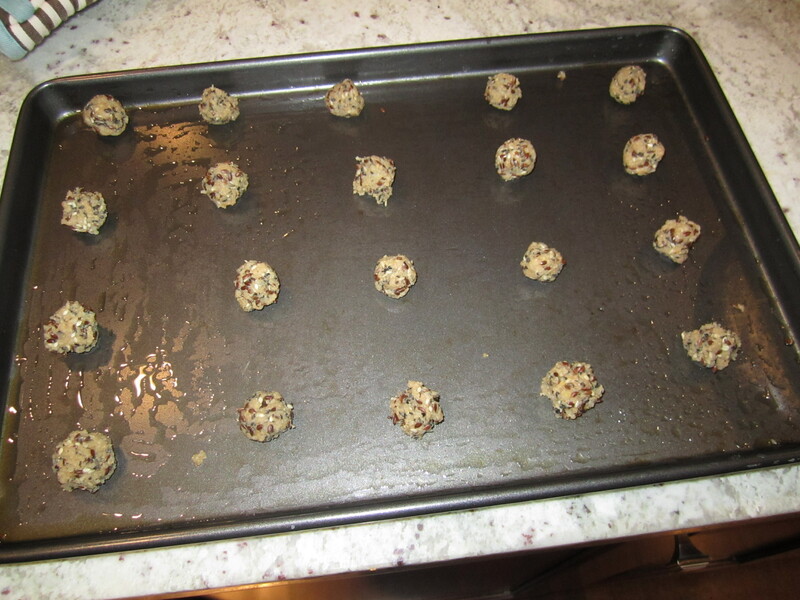 Using a 1/4 cup ice cream scoop (or measuring cup) drop dough onto parchment lined baking sheet. 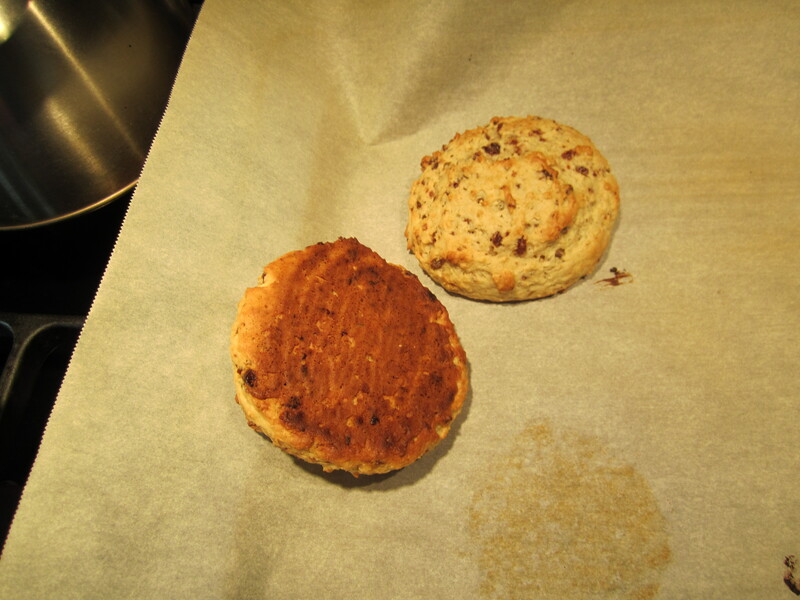 Press down onto top of scones with fork to flatten slightly. Let them rest for about 5-10 minutes before putting in the oven. Bake for about 13-16 minutes. The tops of the scones will be light brown with bits of golden brown showing on top. The bottoms will be golden brown. Transfer scones to serving dish and enjoy! Posted in Breakfast, Desserts/Treats and tagged cherry, oatmeal. Bookmark the permalink. With the New Year upon us, I thought sharing an easy appetizer was in order. A killer cheese plate and spinach artichoke dip are my go to starters for parties, but I also love to serve something just a little bit lighter on its feet. This bite is especially great because it involves no cooking, doesn’t require a recipe, and delivers when it comes to flavor. At the forefront of this appetizer is smoked salmon. I like to use pepper crusted salmon by Rushing Waters, a local company. They are a great source for fresh trout, but also make smoked fish and spreads. I start this by adding the cream cheese, herbs, and a little milk to a food processor. Process this until the herbs are chopped. The mixture should thin enough to easily dollop, but thick enough to hold itself on the cracker. This can be done in advance and the easy assembly can be done before serving. Perhaps the perfect task for the early party guest that is eager to help in the kitchen. To put these together, I top the crackers with the cream cheese mixture and place a cucumber slice on each cracker. After that, add some smoked salmon to each piece and finish with a little squirt of Sriracha. I think these would be great garnished with sesame seeds as well. If you want to lighten this up, you can even omit the cracker and use the cucumber as base. I hope this party bite tip finds you well and that everyone has a very Happy New Year! Posted in Appetizers and tagged cream cheese, cucumber, herbs, smoked salmon, sriracha. Bookmark the permalink. My blog has unfortunately been on a bit of a hiatus lately, but I had some things to share with you, so here goes. On a bright note, now I know what my new year’s resolution will be: Blog more! Let’s start with the first. If you have never seen a cauliflower or broccoli like the one here (sources seem to refer to it as both Roman cauliflower or Roman broccoli) then I would guess you are not alone. This is the Romanesco variety and I think it is fabulous. They do look more like something out of the Super Mario Brother’s garden than your local farmers field, but I think that is what makes them so much fun. We recently had this for the first time while dining at Forequarter in Madison and I’ve had my eye out for it since. These made an appearance at a local grocery store over the weekend, so I picked one up. For my first try at cooking this, I divided this into florets and tossed them with olive oil, a grated garlic glove, some minced hot peppers, rosemary, and of course some salt and pepper. I pan roasted these in an effort to save time, but would go with an oven roast at high heat for 20-30 minutes next time. The conical shape made it difficult to char anything but the stems. Despite being just a little underdone, I found the flavor to be delicious. Of course, I had to finely grate on a little cheese before serving. I chose some Belavitano Gold for this and was very happy with that selection. I can’t wait to find another one of these so I can perfect the method. Check out some shots from my romanesco cooking adventure. You may remember my award-winning Chewy White Chocolate Chip Gingerbread Cookies. I will be donating some for the sale! If you know anyone who might be interested in attending this, please do share the blog or forward the link above. As promised, I had three things to share. The last must be prefaced with a quick childhood story. My signature dish from my childhood was what we called “Coconut Peas”. It was literally frozen peas and sweetened coconut. My family pretended to like it, but it is now something we joke about. Well, tonight they made a reappearance of sorts. I was trying out a green curry spice rub from World Market on a flat iron steak and needed a quick side dish. With no fresh vegetables in sight, I grabbed some frozen peas and threw together the following in a saucepan. Thanks for reading and hope this inspires you to cook something new or buy some cookies for a good cause. Cheers! Posted in Side Dish, Uncategorized and tagged bulgur, peas, romanesco. Bookmark the permalink. Growing up, I recall broccoli with cheese sauce being a very popular side dish. I am sure it is still a favorite in some circles, but it’s not something I’ve had for ages. I’ve been roasting my broccoli lately and I don’t think I will ever go back. Today I am sharing a technique, not a recipe…and really just want everyone to know how wonderful a modest stalk of broccoli can be when it is given a little gourmet treatment. Preheat oven to 425 degrees. Rinse broccoli and dry well. Cut into pieces (best described as two-bite sections). The stalks can be tough, so if I have plenty or if this is for company, I will trim most of the stalk off. But, when it’s just my husband and myself, a little chewiness doesn’t bother us. 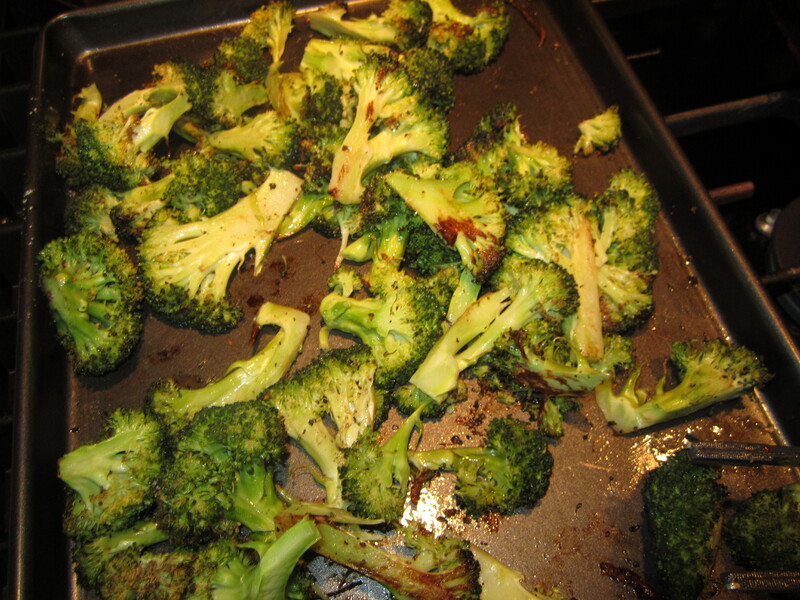 Toss the broccoli with olive oil and season well with salt and pepper. Go with a light drizzle when you’re feeling healthy, but ramp it up a bit when you’re feeling like splurging. This works great with herb or garlic infused oils too. Roast for ten minutes. Flip the broccoli pieces and return to oven. Roast for about ten minutes more. Your florets should be starting to brown and crisp. Remove from oven and toss with cheese, nuts, etc. If I start with raw nuts, I usually just chop those and add them during the flipping step. I know that roasting broccoli may not be new to many of you, but it is just sooooo good that I had to make sure all my followers are in the loop. It takes a frugal vegetable and turns it into a foodie worthy side with little effort. I will admit that my current obsession with roasted broccoli started with a fondness for roasted broccolini, but with plain old broccoli being much easier on the wallet, I’ve found myself making the latter much more often. 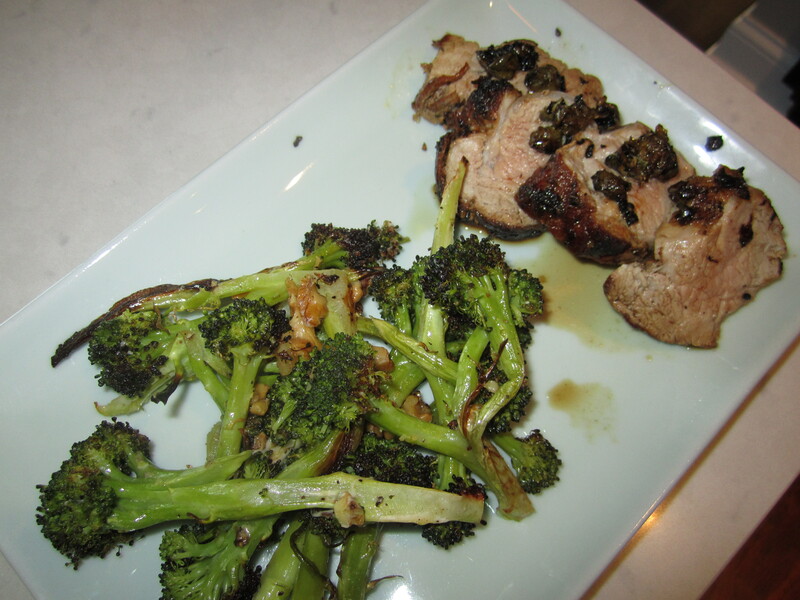 This is so versatile, I don’t think I need to make a protein recommendation, but here’s a shot of variation #1 with a lemon and caper topped pork tenderloin. Cheers! 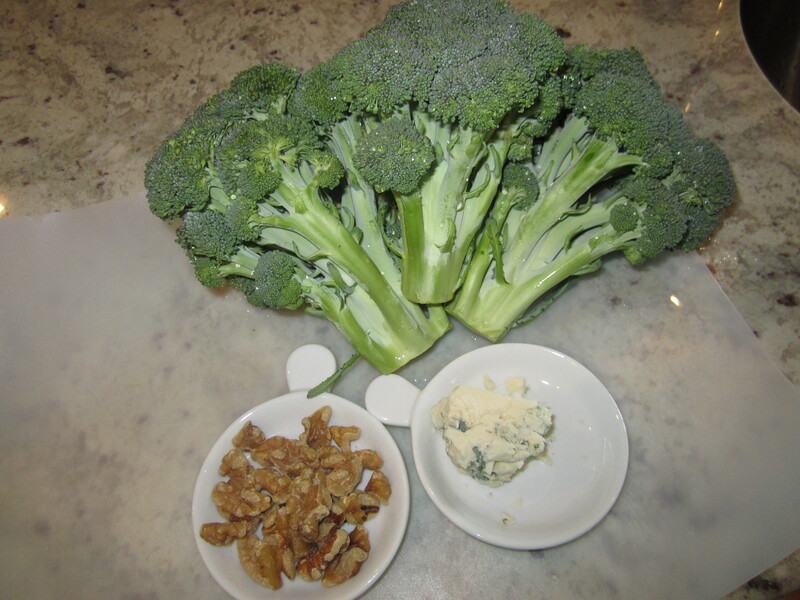 Posted in Side Dish and tagged blue cheese, broccoli, walnuts. Bookmark the permalink. 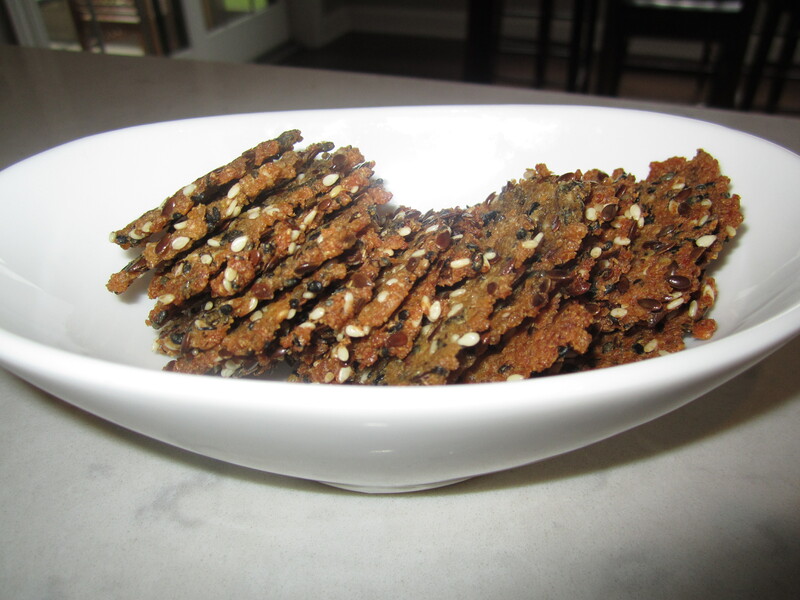 It’s crazy to think I haven’t blogged for months, but I’m breaking the hiatus with these healthy, homemade crackers. I enjoy the brand Mary’s Gone Crackers and came across a few different copycat recipes online and decided to create my own version, heavy on the sesame. Making homemade crackers is also very satisfying, especially if you already happen to have all the ingredients required as I did! From my research, soy sauce is not technically gluten free unless labeled as such, but if you do use a gluten-free soy sauce, the crackers will also be gluten free if that is a concern. Preheat oven to 350 degrees. Bring 2 cups of water to a boil. Stir in kosher salt, herbs, rice, and quinoa. Reduce heat to low and cover. Cook for 30 minutes, then remove from heat for 5 minutes before proceeding. In the meantime, let seeds toast in oven for 6-8 minutes. Place 2 t. water in food processor fitted with metal blade. 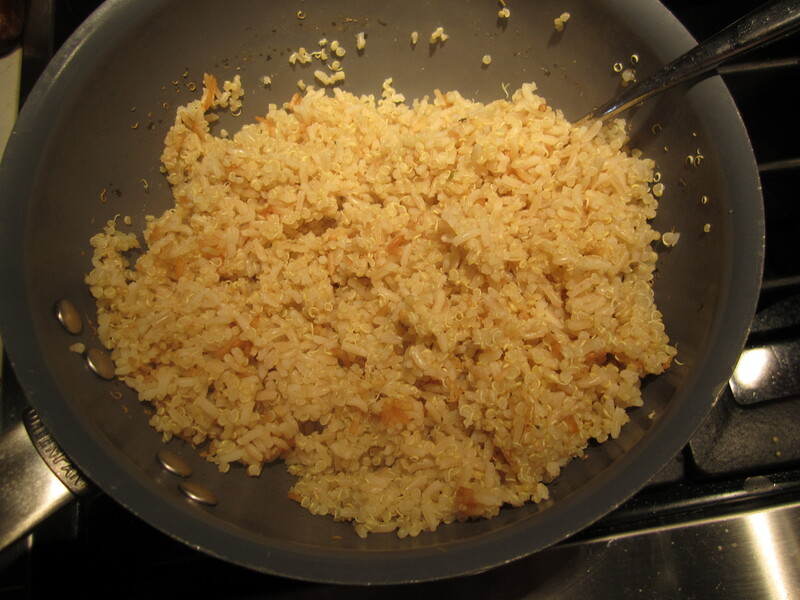 Add rice/quinoa picture and process until a paste forms. Add soy sauce and continue to process until combined. 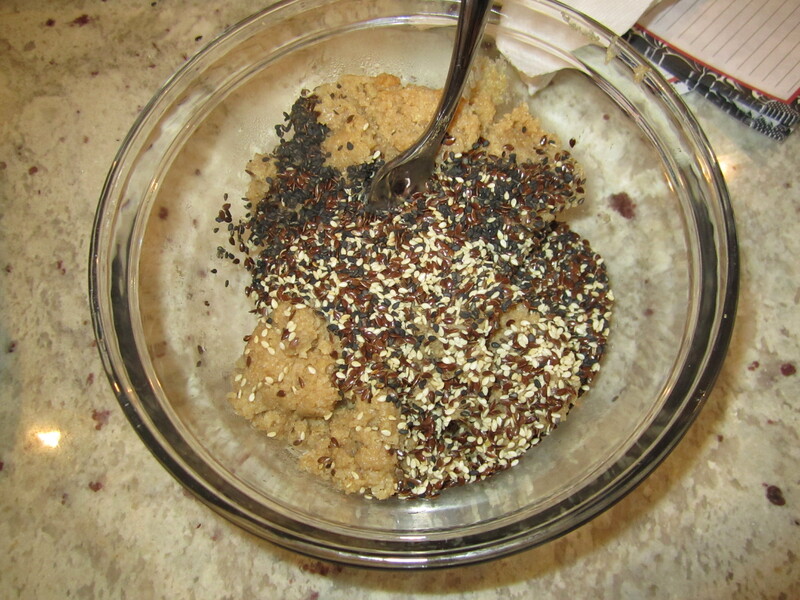 Transfer mixture to a bowl and stir in seeds, salt, and a few turns of pepper from a mill. Stir mixture until seeds are fully integrated. The mixture will be very sticky and thick. 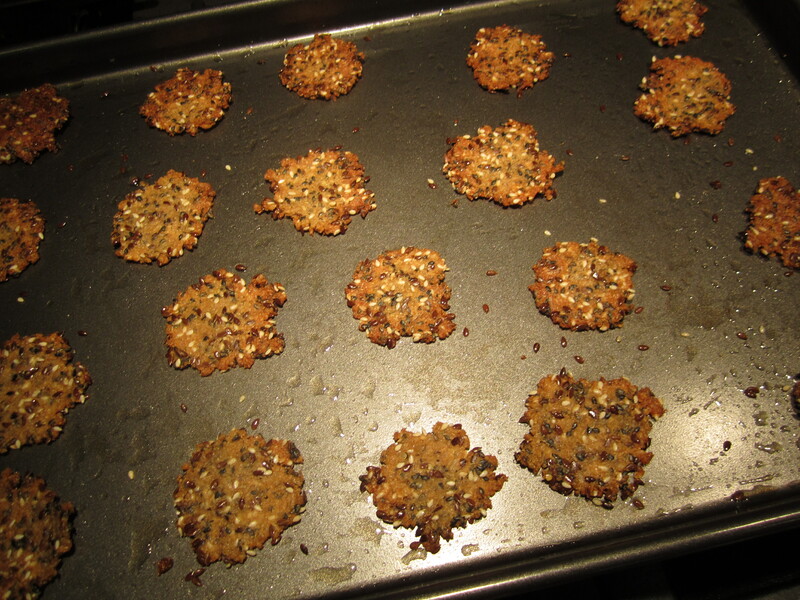 Bake crackers until golden brown throughout and dark golden brown at edges. This took 18-22 minutes depending on the batch. Enjoy! Impress your friends by sharing your homemade crackers if you don’t eat them all yourself! Posted in Appetizers and tagged crackers, gluten-free. Bookmark the permalink. I suppose this post would have been more appropriate to start the New Year, but it still feels like 2012 has just begun. Since Christmas, I’ve acquired a short list of new things for the kitchen; ALL of which I am very excited to share with you. 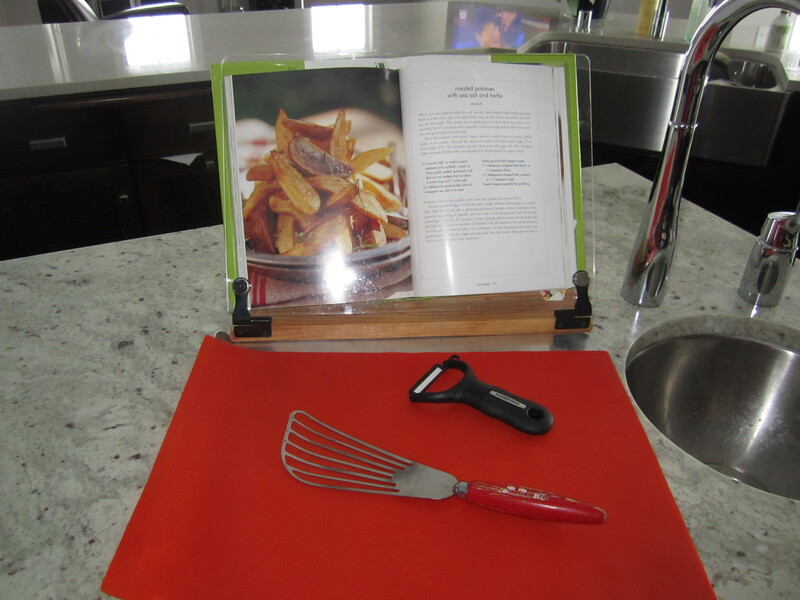 The first item is this cookbook stand given to me by my mother for Christmas. Thanks mom!! It is truly awesome. Who knew I’d be so excited about a cookbook holder, but if your cookbooks and magazines tend to look like they’ve gone through a food war after you cook, you need this too! This one is made by Clear Solutions and I guess it was rated #1 by Cook’s Illustrated Magazine. A clear cover goes over your pages to protect them from splatter. It also folds for easy storage, which is a definite plus. The second is a ceramic Y-Peeler. Why did it take me so long to buy a Y-Peeler? 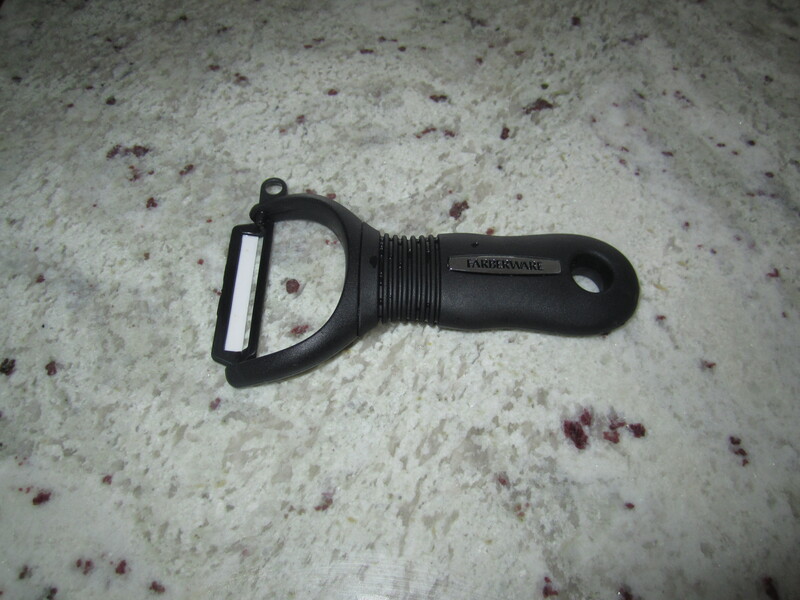 This makes peeling large items so much easier than the traditional designed peeler and I personally prefer it for peeling just about every vegetable I’ve tried so far…cucumbers, carrots, potatoes, squash…I am a big fan of the Y-Peeler. Plus, the sharp ceramic blade lets me put it through the dishwasher without fear of dulling. 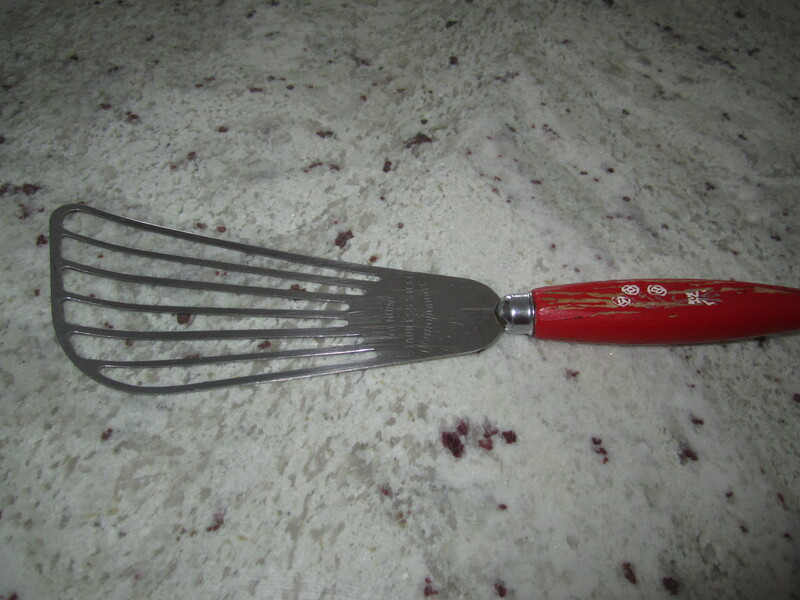 Next up is a stainless steel slotted spatula. Mine is a vintage find from my mom’s kitchen. Apparently she hadn’t been using it, but I love it so much that I feel bad that I’ve taken it from her. 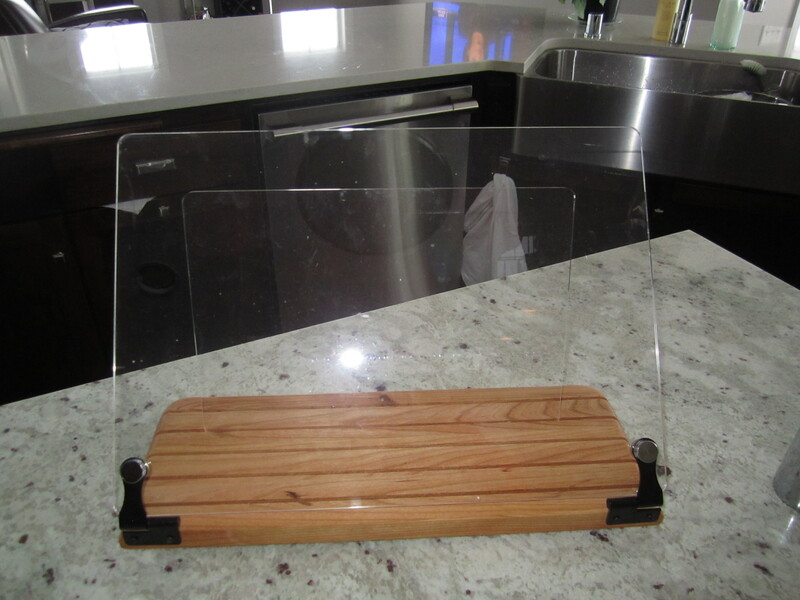 From carefully turning eggs to removing cookies from the cookie sheet, this is another item I can’t believe I waited so long to add to my kitchen. 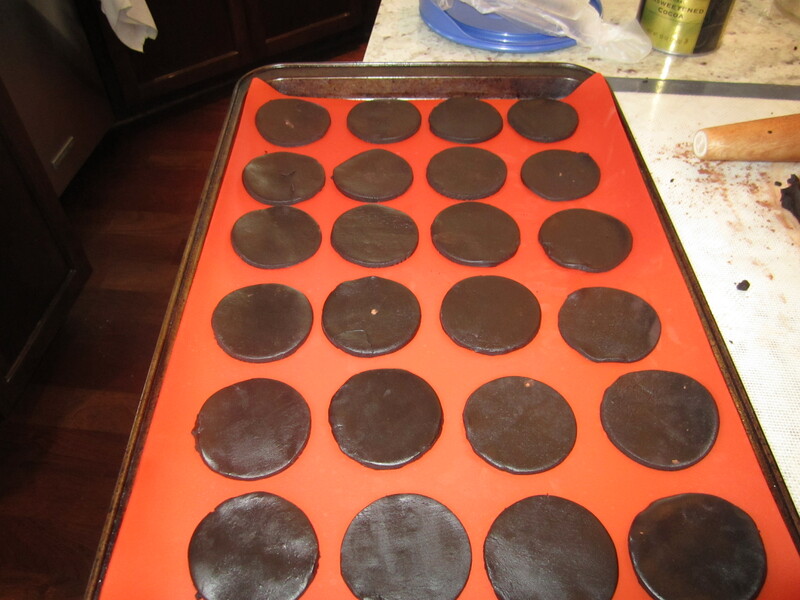 Speaking of cookies, I finally bought a silicone baking mat. I was gifted a larger silicone mat a few years ago and love it for rolling out dough, but it is too large for any of my baking sheets. This one was under $10 from Nordic Ware and I’m loving it. My addiction to parchment paper has been curbed in favor of baking with this mat. And finally! This one is more of a fun gift for myself than a kitchen essential, but I was very excited when it came in the mail on Wednesday. Bobby Flay recommended I buy this on Open Sky and it’s called “Bobby’s Bourbon Barrel Baking Bundle”. (I say that jokingly. If you aren’t familiar with the site, you sign up for free membership and receive regular e-mails stating that different celebrities have shared a product with you.) 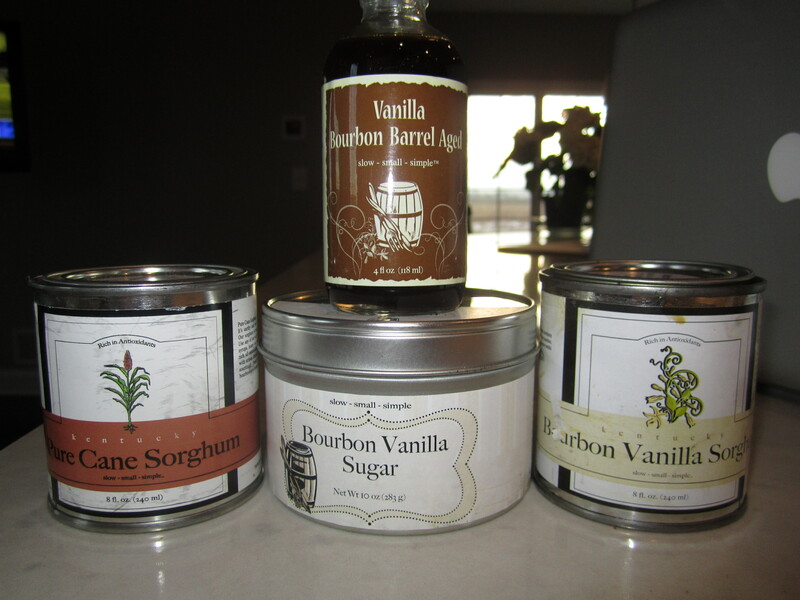 The bundle contains regular sorghum, vanilla bourbon sorghum, bourbon barrel vanilla, and a bourbon vanilla sugar. If you’re not familiar with sorghum, it is a natural sweetener more commonly used in the south. I had never used it before, but it had been popping up in my latest food magazines and I figured I better have some on hand. 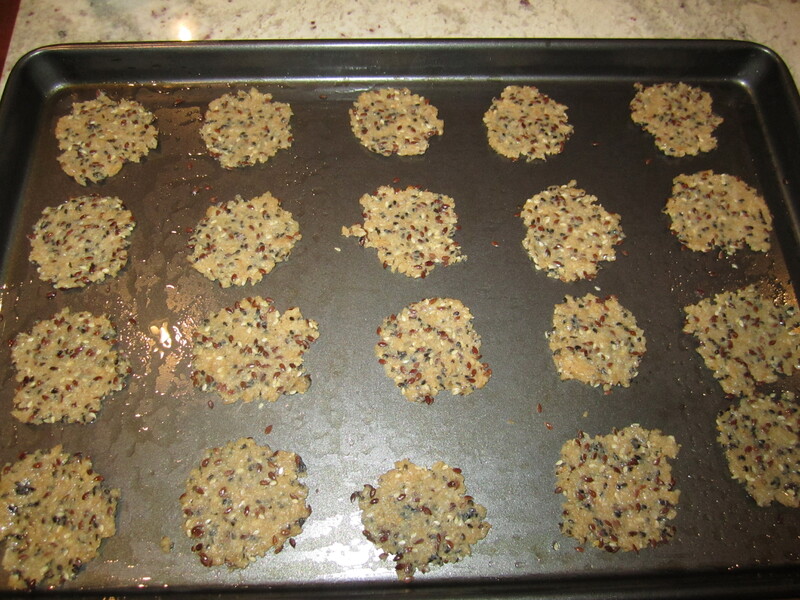 I used the bourbon vanilla sorghum in some chocolate chip pecan cookies this week and they were fantastic! Well that’s what is new here. I guess I’ll get cooking!